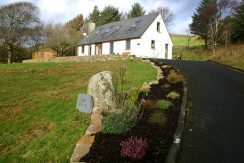 MOYARD : Central Position, Secluded Beaches, Great scenic walks, Ballinakill Bay, Trout angling. Highlights are Connemara Bog Week, Letterfrack Sea Week. Moyard is small, quiet, but surprisingly well situated village on the road between Clifden and Letterfrack. Cleggan, Clifden and Letterfrack are all within easy reach and there is a small post office here. Nearby The Rosleague Hotel, a four star hotel and restaurant open to non residents is a great place for a relaxing meal or a drink. Moyard is home to one of the best known craft shops in the area. Avoca handweavers is here (or “the impossible shop” as it is sometimes known) and has a large stock of quality Irish crafts. Opposite the handweavers is a pier where you can trips on a glass bottom boat. There is also nice seating area here for having a picnic. This village is also on the route to the famous Kylemore Abbey, and is an ideal base for touring and exploring this scenic part of north-west Connemara. 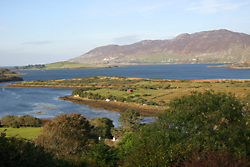 The Connemara National Park is a short drive away, along some scenic coastal roads. For the outdoor types this is a great base, a walk up to Cregg from the main N59, on the right just before Rosleague hotel will take you up to a TV mast and disused quarry, a decent walk but well worth doing just for the 360 degree views from where you can see all of Connemara on a fine day.There is a lovely and secluded beach at Ross on the south side of Ballanakill bay, and the shoreline in Fahy bay is a great place to explore a huge variety of sealife at low tide and there are some good shore marks for beach fishing.The trout angler can investigate Garraunbawn and Ballinakill lakes, there is Salmon and seatrout fishing in the Kylemore Abbey Fishery and Ross beach in Ballinakill Bay provides some good sea fishing. Coming from Clifden dropping down into the Moyard area on the N59 or from Cleggan Stop at the view point beside the Thatched craft shop you will see some of the most breathtaking views around, with all of Ballinakill harbour, the Twelve Bens, and the tapestry of fields and Blanket Bogs can be seen from the top of the hill. Just beyond the craft shop you will pass a small country house hotel called Crocnaraw which has been in the same family for many years. Continue on along N59 it could be worth your while stopping at world famous McMurray Carpets, you never know you might pick up a bargain!